My first bike was a used 1978 Honda CB450. Red and black, not a mark on it. I had no idea how to ride a motorcycle, not a clue. In fact, I couldn’t even drive a car with a standard transmission, let alone a motorcycle. Thankfully my friend Dale had a trailer and took it home for me. It was home, but now what? I began to teach myself in the yard – a much softer place to fall. Thus began my days of riding. By spring of the next year it was time to move up in size, and style. 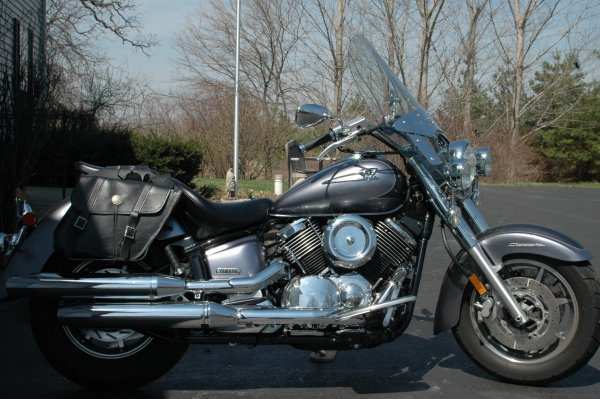 I traded for a 1987, 750cc Yamaha Virago. Black and maroon and lots of chrome everywhere! It had a few more accessories on it than my Honda and was more the cruiser style I had in mind. The following spring, I made the mistake of “just looking” at a brand new bike. 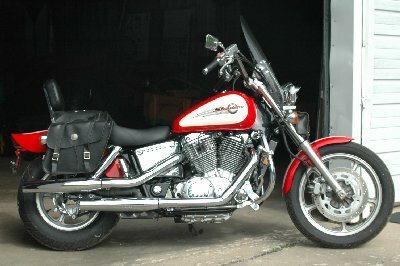 I liked the Virago so much I went back to the Yamaha dealer. There sat a beautiful customized Virago. Corbin seat ,custom pipes, chrome engine case guards and studded saddle bags. I had to have it. It was a teal and pearl white color combo. I had engine guards and saddle bags on my 750, so I swapped those to the new one. The seat & pipes were a definite had to have. The pipes had a great rap and the seat was the most comfortable I’ve ever had as I later found out. Then I realized it was an 1100cc and was heavier than I was used to. I’d worry about that later, it just looked too good! I added my own tool bag, windshield and foot pegs right away. Eventually I put on an after market cruise control which was great on trips! Within the first year of owning the 1100, I’d ridden over 10,000 miles. I did quite a bit or riding and took a lot of trips. I used to go out on weekends and just ride. No particular destination in mind, just wherever the wind took me. It was not unusual for me to log 500 miles on a weekend. Riding, especially alone, is extremely peaceful. It is a time when you can just let your mind go where it wants to. Sure, you must always be alert when riding, but to be out on country roads, enjoying the scenery, the wind in your face? Talk about a feeling of tranquility. My longest trip was to Thunder Bay Canada. Round trip was 1,300 miles. I stayed in Lutsen, Minnesota which is along the North Shore. I rode up and down the shore and into Thunder Bay quite a few times. It’s absolutely gorgeous up there. Another long trip was to, as well as all around, Ashland, Wisconsin. I ventured into Minnesota on that trip once again riding along the North Shore. I took a trip on the ferry over to Madeline Island. Lake Superior on a ferry, with a motorcyle is well, rather interesting. I’ve also taken it to Door County, WI camping, riding to the tip of the Pennisula. Packing for a bike trip is an art form. You don’t have a whole lot of room to store things. It becomes a challenge unto itself to see how much you can strap, bungee, tuck and balance. Balance is the big part. Whatever you put on, you better be sure that the weight is balanced. More importantly, that it stays that way or you could be in a world of hurt if it shifts at an inappropriate moment – which actually is always inappropriate on a bike. I used my saddle bags, a tank bag, tail bag and usually some kind of duffle bag as luggage. Sound like a lot? It is. I usually carry about 30 pounds of additional weight in “stuff”. There are a lot of things to consider. Even just for a long weekend. You have to be prepared for every kind of weather so you end up bringing a lot of clothing. I bring an extra helmet as well. Since I’m a photographer, I’d have some of my camera equipment that needs to be packed very carefully. An extra pair of shoes is a must – just in case. I always end up looking like I’m going somewhere for a month when I leave with the amount of clothing I bring. However, I don’t think I’ve ever packed too much. I’ve always ended up needing all that I’ve brought. One trip I rode for 6 hours in constant, driving rain. My rain gear did an adequate job, but I did go through 3 pairs of gloves and my boots were soaked. It was only 50 degrees the whole time, so not only were my feet soaked, they were cold! I looked like a drowned rat when I got to my destination. On a bike, at 40 mph, there is a 15 degree windchill factor. Obviously, the faster you are going, the higher that factor becomes. It can get very cold when you are riding and the outside temperature is only 32 degrees. That was my ‘cut off’ when I was much younger. If it was at least 32 when I left for work, I’d ride. Considering my commute is mostly back roads at 60mph, and a ride of 40 minutes, there were too many mornings where I had to pry my frozne hands off the hand grips when I got to work. Unfortunately, that cooler temp thing does not work in hot weather. It feels quite the opposite. You are very close to that hot pavement, the sun is constantly beating down on you, and the engine that is between your legs and under you, gets mighty hot! One trip was during a heat wave when the temperatures were above 100. I was in northern Minnesota where it got to about 60 for a high. The day I left Minnesota, it was dreary, damp, 45 degrees with a slight mist. I had my full leathers (which I always wear while travelling) long sleeve shirt over a short sleeve one, heavy sweater and heavy gloves on. As I got closer and closer to home, the layers started to come off. I’ve ridden the other way around as well. Where I had to dig out my heavier clothes at some point. You just never know, and there is no heater or air conditioner to turn on, so you’d better be prepared! Anyway, the last few hours of my ride home was pretty uncomfortable due to the heat. I sold that bike the following year. When I sold it, it had close to 18,000 miles on it. This is not a good selling point for a 1-1/2 year old bike! I’m told that a lot of people don’t ride that in their lifetime. 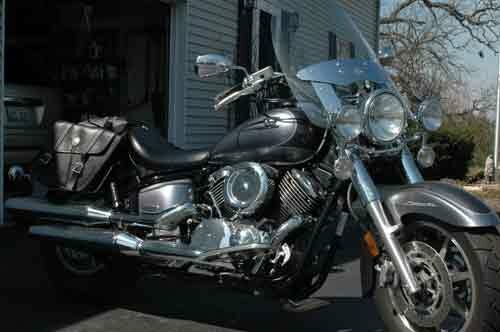 The cruiser market was beginning to come alive again and there were all kinds of new models. 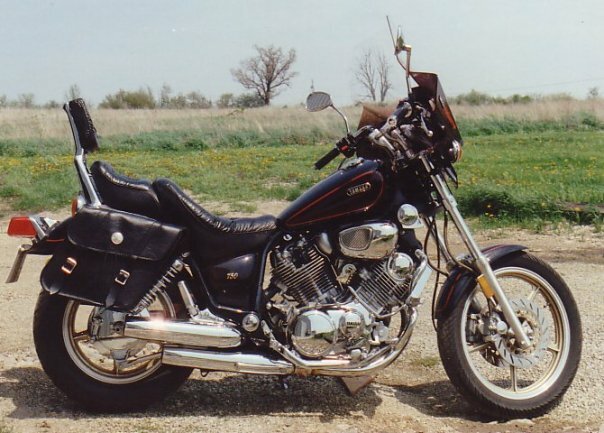 The Virago was becoming “tired” looking to me. It just didn’t have the pizzazz anymore. 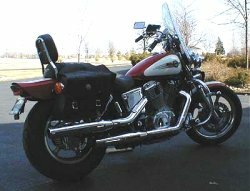 I started looking and really liked the Honda Shadow’s. 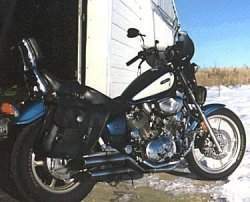 The 1100cc Spirit was my next bike with its foot pegs sitting slightly forward for a more laid back cruiser kind of style. I kept my saddle bags but had to leave all my other “toys” behind. I ordered pipes, then decided against it. The engine rap that I’d become accustomed to, I would have to live without. I decided to get a light bar with spots, highway bars and chopper style windshield. Now my Shadow is a sweet looking bike! I’ve since added visors for the lights – except the headlamp that is. Actually, I have it, just haven’t figured out how to get it on yet! Yeah, I know, I’ve had the bike long enough! The spots went on fairly easily, but the headlamp was another story. I got aggravated and gave up. For someone who didn’t even know how to ride, I was on my 4th bike after 4 years! I’d logged 25,000 miles by that time. I ride solo and have taken all my trips alone. It is a great conversation starter wherever I go. People are always amazed by my being a woman, riding a motorcycle, not to mention my doing it solo. Or to use the proper term: “one up”. People ask if I’m afraid riding alone as a woman. I honestly have to say that I never have been. Not because of being alone or a woman. It has usually been more because of what has happened. Being completely boxed in by demented semi drivers on the interstate. Having them force you to ride at speeds of over 80 mph until they get tired of the “game”. That is frightening. Or while at a scenic overlook, in Minnesota I walked away from my bike and heard a crash. It fell over. Thankfully there was a guy there, though he struggled, was able to pick it up. The engine guards saved the bike (it also was only 3 months old!) Riding in the rain on interstates, or anywhere else, is also frightening and dangerous. Many times I’ve been one of those riders you see sitting under an overpass waiting for the heavy rain to stop. I hate, hate, hate, riding in the rain. People also wonder about what I do when I stop somewhere. Yes, “everything I own” is just sitting there on the bike. No, not been afraid of it being stolen. It’s uncanny really. There is almost an unwritten code of honor or whatever you want to call it. I’ve not heard anyone that has had something stolen off of their bike. True, I don’t leave it all packed over nite and sitting out but I rarely worry about it if I stop to eat or use a bathroom. It’s kind of like camping. You leave all of your stuff in your tent, no one steals that. The “unwritten code of honor”. Bikers themselves kind of look out for one another as well. Most especially I notice this when travelling. I always feel as though there will be someone to help me if I ever need it. I doubt I’ll be trading up anytime soon. With the MS, I find I am riding less and less each year. I have to admit that some of that newness has worn off. I no longer ride just to be riding. I also am getting older – did I really say that?? – and cold weather riding is not as easy as it once was. Or should I say, it takes a lot more convincing in the morning. I used to have that 32 degree rule. Those frozen hands were way too uncomfortable. Since you need your hands to ride, it was also a little dangerous, not to mention stupid! Okay, I’m not getting older – I’m getting wiser! After the Shadow sat for several years of not being used because the MS prevented me from riding, I went into a remarkable remission and was able to ride once again. Because the bike had sat so long (over 3 years) without really being ridden, it needed much TLC. I had to have it picked up and taken in on a flatbed for some work on the engine. After getting it back, I never really liked how it rode. What to do? Buy a new bike of course! I had always had the idea in my head of the laid back cruiser that only came with a larger bike. 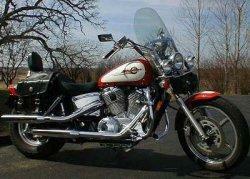 Heading to my friendly Yamaha dealer I found the perfect bike, A 1100cc V Star Classic. The bike was big. 10 inches longer than the Shadow big. It was heavy. 200 pounds heavier than the Shadow heavy. However, it sat a bit lower to the ground making it much easier to hold up and handle with a lower center of gravity. It wasn’t quick by any means. It lumbered from a stop, but once it reached 4th gear, it loped along and “sat down”, keeping up with the best of them. Unfortunately, the days of taking trips and long rides were long over. Riding the back roads around Wisconsin was nothing like they used to be. There is so much traffic now no matter where you go. Riding wasn’t as much fun as it used to be. You had to be on high alert all of the time. This gets very tedious. I rode to and from work when weather permitted. Within 2 seasons, it became clear to me, that I had no business being on a bike. I was having too much difficulty with Cognitive Function, balance and leg strength. I was able to use the bike as a trade in on my next vehicle. Every now and then, I miss the days of just cruising. I miss the freedom that it brings. However, I have a lot of memories to look back on and remember all the places I saw that I never would have were it not for that freedom. I’m loving your memories of days gone by. Very cool my friend, very cool.